What options do college leavers have in 2018? College leavers have always been expected to make the choice between going to university or getting a job. This will probably remain the same for many years to come, except that now college leavers have a far wider range of options in addition to these two choices. At the age of 18 when learners leave college, individuals are at vastly different stages of thinking when it comes to deciding what to do next. Some may be keen to keep progressing along the academic route, whilst others will have struggled through college and be ready to do something less academic going forwards. Others will have absolutely no idea what they want to do and this is okay. It’s also really common. Apprenticeships have gained a good deal of positive recognition in recent years. Not only do they provide a vocational approach to allow people to learn, but they’re a great way of obtaining qualifications whilst working. Apprenticeships are also an excellent opportunity to try out an industry or sector to make sure it’s one that they want to progress in, before committing to spending the time and money on a degree in order to progress, or committing to an area of work for the next step in their career. If after an apprenticeship, a college leaver wants to try something else that’s entirely different, they haven’t lost anything – instead, they have learnt new skills, stepped out into the world of work and at least learnt what they don’t want to do, all whilst earning some money. Volunteering is another way of working out what it is that is right for an individual as a college leaver. New skills can be obtained which are transferrable to all professions and industries, such as customer service and organisational skills. The other benefit of volunteering is that whilst it doesn’t usually pay, it is still a rewarding thing to do, as a college leaver is helping and continuing to achieve results whilst they’re volunteering. Internships usually offer fixed term placements at a company and can last weeks or months. Whether internships are paid or not can vary. Often internships can lead to further employment with the same company, or a foot in the door with another because of the experience gained. As with apprenticeships and volunteering, an internship is a great way to try out a certain industry or sector, as well as different tasks, to identify the type of work college leavers want to do in the future, based on what they discover they like doing and are good at. A sponsored degree is different to simply choosing to go to university, mainly because an employer will pay a college leaver to do their degree. This is usually in the form of distance or part time learning, as a college leaver would also need to be working for the employer for them to sponsor the degree. These are ideal for college leavers who have a good idea of the type of work they want to do, or the type of industry they want to work in, because they will gain both skills and qualifications by advancing with the sponsored degree route. However, for college leavers who aren’t sure that the workplace or degree topic is interesting or beneficial enough to them, it’s best not to commit to completing a degree when it could be something that’s both a complete drag to do as well a waste of time for both the learner and the employer in the long run. Gap years aren’t just for travelling the world – many people leaving college in 2018 will choose to go full time in their part time job or work for someone they know, simply because it’s something to help them generate both money and skills whilst they decide what they want to do. Going to university is expensive and it can be difficult to secure jobs with little experience, so sometimes any type of work or experience can be beneficial within a gap year. At the end of the year, college leavers will hopefully be in a better position both financially and knowledgeably; knowing what they want to do. This will often help inform whether to go to university or into a career and in either case, what type of course or career, too. College leavers seem to be becoming more entrepreneurial. Whether it’s setting up a creative service like copywriting or photography, or simply working freelance as a labourer, many college leavers take their destiny into their own hands, by using what they already know they’re good at to make money and build on their skills. 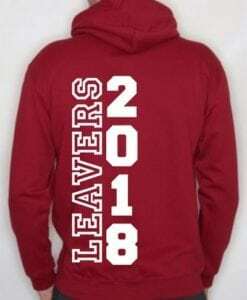 One thing that every college leaver needs (in our humble opinion) is a leavers hoodie. It reminds them of their achievements, their friends, their teachers and their college and provides a sentimental but useful token that they can take with them, whichever path they choose next. There are many customisable leavers hoodies available for college leavers. To view our range of styles and colours, see our design options page and if you have any questions, please feel free to call us on 01858 461 686.